I always feel a little dirty after publishing a blog post. You know, because I've revealed something, probably something unflattering, about myself. Something usually negative. I don't actually hate my life. Today. After all, the leaves are turning, and there are a lot of trees around here. Tourists come here to see the scenery I see everyday as I grudgingly drive hither and thither pursuing my suburban aims. I often appreciate the open sky and the treeline, I'll have you know. Just yesterday I lived through a semi-glorious, semi-harrowing exploration of the natural beauty of Upstate New York. Emboldened by an encounter with a woman at the dog park who told me about a great walk not too far from town, I decided to take advantage of the gorgeous day (trying to forget that it felt like spring, not fall, and to just enjoy the sun, clear sky, and weirdness of fallen leaves in the 70 degree weather). Of course I checked out the map on the interwebs before venturing out, saw the Bennett Hill Preserve of the Mohawk Hudson Land Conservancy (http://www.mohawkhudson.org/preserves/Bennett.htm)was quite simple and -- most important -- basically a closed loop with only one entrance and therefore impossible, I repeat, impossible to get lost. I don't have the greatest sense of direction. In early days in Central Park, I am compelled to admit that I started out more than once, with a child in a stroller, at 79th and Central Park West, aiming for 84th and Madison on the Upper East Side, and ended up at say, 106th and Central Park West, after crossing to within viewing distance of my intended destination. 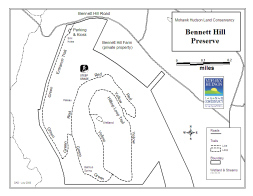 The Bennett HIll Preserve is no Central Park. One easy path, one hard path up a largish hill to a loop, all color-coded. All I needed was green to yellow, avoiding red, zip-zoop. The woman had told me it took about an hour to go up, walk the loop and return. I found the place very easily, just alongside a charming (smelly) dairy farm (cows are louder than one might think). I believe this is the dairy farm from which our milk comes. Anyhoo, there was one of those little sign-in boxes, which was cute, but gave me pause, as I recall some serious hikes in New Hampshire with my rock climbing friends where you have to sign in. Implication being if your body is discovered, they can identify you by your name in the log.....I signed in. I also considered calling the husband to tell him where I was since I was walking alone (!) except for one very fluffy, large dog no one takes seriously. I brought water for myself and for the dog. Since the walk would only be about an hour, I left it in the car. (!) Then Milo and I set out along the one and only path leading to the two paths up the hill to the loop. It was a really lovely path, the first part following the edge of the meadow where the noisy cows grazed. We had to really bend under a fallen tree at one point, but that was fine. Then the path turned up the hill and wound along. I didn't see any trail markings or anything, but it was a path. Kind of steep at one point. I thought I saw a red marking on a tree and thought that was peculiar, as I had intended to take the easy path and wasn't sure now where I was. Eventually, we met up with the yellow path around the top. The intersection was marked with a pretty stile. There were two painted yellow spots on a tree right at the jointure. Milo and I followed the yellow path, which was clearly marked, my pounding heart noted with relief. I remembered this path made the loop at the top and figured if I followed it around, we'd either get back to the stile or find the green path. So we walked. It was a narrow path, up and down, full of leaves and pine needles, and through a forest of pines and other finer limbed trees. Thoughts of how big a no-no it is to go off by yourself, especially for a woman, started intruding. I hoped the dog counted as a companion, although I doubted his, shall we say, efficacy in an emergency. Now rattled, I saw no sign of the green path, and then, indeed, saw the marks for the red path, which seemed to be taking over for the yellow path. Now I was confused and rattled. I had been on the red path on the way up, right? So I decided to retrace my steps. It had been about 35 minutes. Suddenly I thought of all the idiotic hikers who perish on seemingly benign hikes because they haven't compasses or water or even a granola bar, not to mention the seasoned travelers who get stuck in a sudden attack of bad weather on Mount Washington every summer. Here I was, in upstate New York, serious country, and I had left my water in my car. Furthermore, I was alone, and anyone who survives childhood knows you're never supposed to go off into the woods alone. Even if you do have a large dog with you - especially since he's fluffy and people don't take him seriously. Sweaty, panicky, but neither hungry nor thirsty, I started back. The yellow marks were on both sides of the trees, so I had no trouble, until I came to a sort of openish area amongst the pines and found myself going down. This path didn't look right. There were blue and red ties around the trees here, which I hadn't seen before - and they weren't the right colors. I couldn't see the yellow path. The markers were pretty far apart. I debated whether I should continue, since down was at least the right direction, and so maybe this was actually the easy path and I had been mistaken about the green markers. Then I flashed back to one of those hikes with my rock climbing friends (my beautiful lost young men, Steve and Phil), when Phil's girlfriend and I hiked to the rock face with them, and then the girlfriend and I tried to hike down to the car, since we weren't climbing. Tried to hike down, I say, but couldn't find the path. Blundered around in the mountains of New Hampshire and ended up climbing down through treetops and scrabbling through underbrush for two hours until we found a road and managed to eventually find the car. Scared half to death. I decided not to just wing it down this time. Providence provided an exit once, but probably wouldn't reward such stupidity twice. I started back up to where the yellow path was supposed to be. Milo had hesitated before going down this way, after all. He probably remembered the smell. With a careful look around, I found the yellow path again, found the wonderful yellow markers again, and after another little bit, I came upon the convenient, blessed, trail-marking stile. We started down the path, which was definitely the right path, and after a few yards I saw a marker - green - painted on a tree. I had been on the right path the whole way up. I found a few more markers - green- going down. I checked the reverse side of the trees. There were no green markers visible on the way up. Vindication of a sort. I relaxed and we walked down. Milo got to run off-leash, which was a thrill for him, and we made it to the sign-in box, where I mentioned the poor trail markers in the comments section, to our water, and to our home. Milo needed a serious grooming to remove about a million burrs, and that was my foray into the great outdoors. There will likely be a blog post about Lyme Disease one of these days.